As briefly mentioned already, in Canon Law there are three types of reasons which can invalidate a marriage from the beginning. The first type is known as the "diriment impediment." The word "diriment", taken from Latin, means the blocking out of a person’s basic ability to give valid consent to marriage. These impediments can be the result of the very nature of things [e.g. a person is absolutely impotent] or they can be decided by the competent Church authority [e.g. a priest or bishop cannot marry]. The Church can dispense from the impediments she establishes, but she cannot dispense from impediments which arise from the very nature of things. "The very nature of things" is also known as the "natural law" and has always been considered by the Church as the order of reality established by God the Creator. The second type of reason which can invalidate marriage from the beginning regards deficiency of consent. Consent is the act of the will which freely, consciously and knowingly says "I do" to the other party to the marriage. This "I do", however, does not just refer to the person of the other party but to the very reality of marriage itself in all of its constitutive elements. The core reality of marriage is known as the "bond" of marriage. The bond cannot be revoked. Of its nature it is perpetual until death and exclusive of any third "conjugal-like" party. Of its nature, it is ordered to the increasing and overall good of the spouses as well as to the gift of new life. Deficiencies of consent mean that, at the time of the marriage itself, a person’s freedom was seriously compromised for one or more of the reasons contained in the Church’s law on this very matter. It is clear, therefore, that invalidity refers to a serious deficiency at the time of consent. Its main focus is not why or how a marriage broke down, but why or how it never existed in the first place, despite appearances. 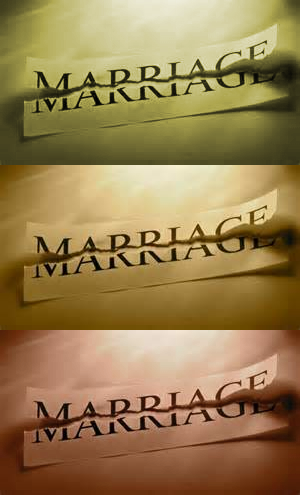 The third type of reason which can invalidate marriage from the beginning regards what is called "defect of [canonical] form." It is helpful to recall that even in civil law, unless the spouses exchange consent before an officially designated representative of society, and in the presence of witnesses, there is no marriage. The Catholic Church is also a "society" and its members are obliged to observe some external rules if their marriages are to be recognised as valid. Thus, the cleric officiating must have the proper faculty to do so; there must be two witnesses; the couple must exchange consent before the cleric and witnesses; any required dispensations must have been sought and granted. Since marriage is a public good in both Church and civil society, the question of "form" is thus essential for validity.